HAL 510 - Strength and Conditioning for the Healthcare Practitioner. This is an online course being offered for graduate credit beginning this summer. Undergraduate students may be permitted to take this course with instructor approval. Congratulations to the Class of 2015 on passing the BOC exam and graduation from SBU! On Friday March 13, 2015 in recognition of National Athletic Training Month 37 Students, Faculty & Staff from the Stony Brook University Athletic Training Education Program will be at The Today Show in NYC. We have organized a group of 200 people to attend TODAY & Good Morning America shows so please tune in between 7-9am to support your athletic trainer! 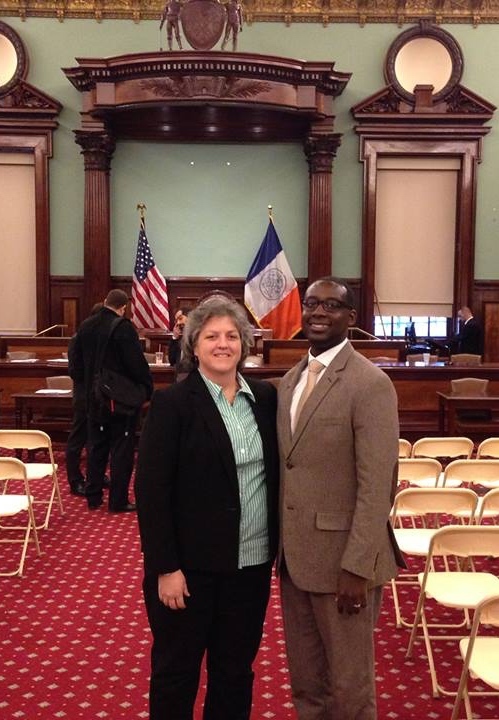 On January 23, 2015, Clinical Assistant Professor James Pierre-Glaude ’06, ‘10 accompanied Aimee Brunelle ‘95, President of the New York State Athletic Trainers’ Association (NYSATA), to a New York City Council meeting at City Hall. They testified in front of the Committee on Health and Committee on Education regarding two introductory bills; Int. 85 and Int. 86. Both bills, which are being sponsored by Brooklyn Councilman Stephen Levin, would mandate athletic trainer presence at all youth football practices/games, as well as create a youth sports health and safety task force to report to the NYC Mayor DeBlasio. As an executive council member of NYSATA, Clinical Assistant Professor at Stony Brook University’s Athletic Training Program, and Brooklynite, Pierre-Glaude offered his professional expertise on issues concerning the seriousness of concussions and lack of sports medicine coverage of youth sports around NYC. Brunelle and Pierre-Glaude were able to educate coaches, parents, sports administrators, and legislators about the role of athletic trainers in sports medicine; all of who are stakeholders of these bills. On September 28th of homecoming weekend the Athletic Training Program hosted a brunch celebrating 10 years of accreditation and 30 years of athletic training at Stony Brook University. Current students, faculty, and staff joined program alumni to celebrate by sharing stories and photos depicting the growth and success of the program to date. This event fostered the rekindling of old friendships among the alumni and inspiring new relationships with current students. At the event, Dr. Stuart Cherney, instrumental in forming the Athletic Training Program and supporting it from its inception, was honored for his dedication to the program over the past 30 years. The program thanks the university, alumni, faculty, staff, and friends in supporting its endeavors past, present, and future. Click here for photos of the fun filled day which are available on SBU Advancement. Pictured in photo are: Billy Goodland ’16, Anthony Castiglione ’16, Aimee Brunelle ATC ’95, Pam Morrison Wiles ’91, Dr Stu Cherney, Glenda LaSalle ’91, Marissa Fleury ATC ’09, Hannah Kuemmel ATC ’09, Monica Lorenzo, ATC ’08, Stephanie Dunn ATC ’08, Rosalyn Nunez ATC ’09, Kim Garcia ’15, James Pierre-Glaude ATC ’06, Emily Edwards ’15, Eugene Lee ’16, Dominick DeStefano ATC ’95, Mariano Gonzalez ’15, Candice Maglione ATC ’10, Lisa White ATC ’87, Barima Yeboah ATC ’06, Adam Montes ’16, Claudine Weiner ATC ’93, Lauren Stephenson ATC, Paul Lasinski ATC, Jaci Smith ATC ’12, James Fetter ATC ’11, Eric Lehnert ATC ’96, Kathy Koshansky ATC, Jeanine Engelmann ATC, Xristos Gaglias ATC; missing from photo: Donna Romano ATC ’91. Support the Athletic Training Fund for Excellence by going here. Congratulations to the Class of 2014 on passing the BOC exam and graduation from SBU! 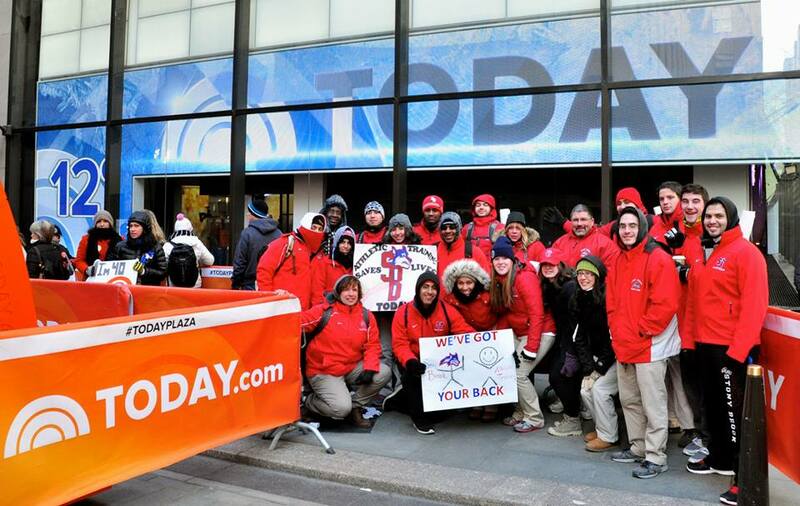 On Friday, February 28, 2014 nine Athletic Training Programs, led by Stony Brook University's Athletic Training Program (ATP), will be traveling to New York City to kick off National Athletic Training Month (NATM) by standing outside the TODAY Show at Rockefeller Plaza. We will be wearing our university attire and carrying signs to help get some recognition for the AT profession and NATM, including this year’s slogan, ”We’ve Got Your Back”. Stony Brook University ATP began this event two years ago, and each year has gained more recognition. Last year (2013) Al Roker even made a comment about NATM in his weather forecast – and due to their success, SBU got ‘Honorable Mention’ in the NATA’s PR Contest for “Best Student Effort”! The hope is that joining forces will make an even bigger impact to promote the profession! This year, we have invited all of D2 and are working with the NATA to help promote this event. We are excited to announce some changes effective the 2014 admission cycle. If you have reviewed our information prior to June 21, 2013 please take the time to review it again as our pre-requistes have changed! In addition, beginning in the fall of 2013 we will institute a Freshman Declared four-year major! MARCH IS NATIONAL ATHLETIC TRAINING MONTH - 2013 Theme: Every Body Needs an Athletic Trainer! Stony Brook Athletic Training goes to NYC - The Stony Brook Athletic Training Program kicked off National Athletic Training Month this year by attending The Today Show in New York City on February 28, 2013. Thirty-three students, faculty, staff and alumni “got their red on” bearing signs with NATM logos and slogans. The signs spread the word about NATM throughout the broadcast and Al Roker took the time to highlight NATM during his weather segment, being corrected to that we are “Athletic Trainers”! Overall a very successful event! The group continued their day in the city by walking uptown to Columbia Prepatory School where one of SBU’s alum, Ammarah Khan, ATC (’09), spoke to the students about creating an athletic training position at a high school and the importance of providing athletic training services to high school athletes. Ammarah was involved in the design of her own athletic training room and brought the group for a tour of her facility, highlighting the critical aspects of her job and the challenges of being in the high school setting. It was an eye opening and inspiring occasion for all of the students. The day was concluded at Madison Square Garden where Jim Ramsay, ATC, head athletic trainer for the New York Rangers, invited the group to tour the athletic training room, strength and conditioning room, and locker room, providing invaluable insights into working with professional hockey players. Jim spent time discussing his life as a professional hockey athletic trainer with the students, faculty and staff and candidly answered questioned posed by the students. The piece de resistance was being invited out onto the ice for a group photo. A huge thanks to Jim Ramsay for a once in a lifetime experience! Stony Brook Athletic Training Program is proud to be a part of promoting our profession. This day was an amazing time for learning about the importance of getting the word out about the services we provide in different settings for all athletes. District 2 Director Michael Goldenberg visits SB – On Sunday, March 3, District 2 Director Mike Goldenberg visited the SB Athletic Training Education Program and presented on “Leadership in Athletic Training". The presentation was well received by the students and faculty. It was evident that Mike’s message was that there is so much opportunity in Athletic Training; “the sky’s the limit”! Providing Healthcare for the Performing Artist. In honor of National Athletic Training Month the Sports Medicine Athletic Training Club brought in Stony Brook Athletic Training Alum Monica Lorenzo, ATC (’08) to present at the Health Science Center on March 8th about Providing Healthcare for the Performing Artist. Monica is an athletic trainer for the New York City Rockettes & the Knicks City Dancers. She has also founded a company called Romo Fit, Inc., which provides injury prevention programs to athletes in New York City. Monica put a new spin on the type of athletes athletic trainers work with for many people attending the presentation. She focused on the importance of showing your value as an athletic trainer and forging forward into new arenas of athletic health care. Monica has been an extraordinary representative of the SBU Athletic Training Program as well as the profession. On March 1, 2012, the Stony Brook University Athletic Training Program, including 24 students and 6 faculty and staff, traveled to New York City to kick off National Athletic Training Month by appearing outside of the Today Show and attending the BODIES Exhibit. Prior to attending the Today Show, students made signs promoting National Athletic Training Month that emphasized this year’s designated theme: Athletic Trainers Save Lives. The group congregated at 6:30am on a cold and wet morning wearing their Stony Brook Red in front of the NBC studio, and was immediately recognized by the producers. Displaying their signs, they were filmed for multiple shots throughout the morning show and piqued the interest of the show’s cast. The students and faculty promoted athletic training not only to Matt Lauer and Ann Curry, but actors Zac Efron and Jason Isaacs and tennis player Caroline Wozniacki. Following the show, everyone attended the BODIES exhibit in South Street Seaport. The students, still in their Stony Brook Red, took full advantage of what the exhibit offers and made a positive impression on the staff and visitors of the exhibit.